My craving of the month was banana bread, which sounds normal enough however - I have never actually baked a loaf of banana bread before! This pregnant craving needed to be satisfied but the first time I screwed it up... The recipe I used was good (it included buttermilk – yum! ), but apparently I overmixed which causes a tougher bread. It was fine microwaved with a pat or Promise on it, but I was aiming for an existential experience. 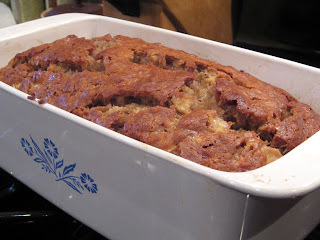 I came across this recipe for Banana Banana Bread and followed it to a T - with the addition of a few autumn spices. You can always add nuts, chocolate chips or maple syrup! Stir banana mixture into the flour mixture, and literally ONLY stir 10-12 times around, that’s it. Avoid the temptation to fully incorporate all those lumps, just make sure there are no visible dry flour pockets. Pour into loaf pan and bake for 65 minutes. Insert a tootpick in to a couple of places to make sure it comes clean. I say to do a couple places b/c you may hit a pocket of yummy banana goodness and mistake it for not being done. 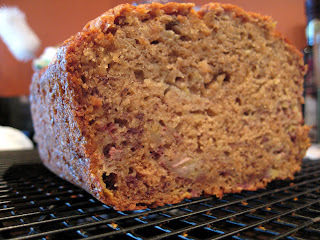 No need to nuke the slices or add butter to moisten b/c this bread is so moist and full of banana flavor. My only problem now is that it’s all gone! 27 Weeks - the Twins are Getting Big!